Participation in the Program for Jazz is by invitation only. The Program for Jazz focuses on composition and small ensemble improvisation. Although part of the program focuses on performing a well-rehearsed concert, most of the days are spent rehearsing with a variety of individuals, learning how to perform well with changing personnel. All 15 fellows write original music in the program. 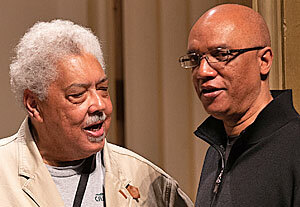 Faculty member Rufus Reid works with Jazz fellows. Ravinia Festival is located on Chicago’s North Shore and runs each year from late May through early September. All Ravinia events are open to Ravinia's Steans Music Institute participants.These include outdoor concerts in the pavilion by the Chicago Symphony Orchestra, often joined by distinguished soloists, and solo and chamber recitals in Ravinia’s Martin Theatre. RSMI’s programming includes jazz concerts and master classes, often with RSMI alums and world-renowned jazz musicians. Your contribution helps Ravinia’s education initiatives reach 85,000 people, extending Ravinia’s mission throughout the Chicago area.